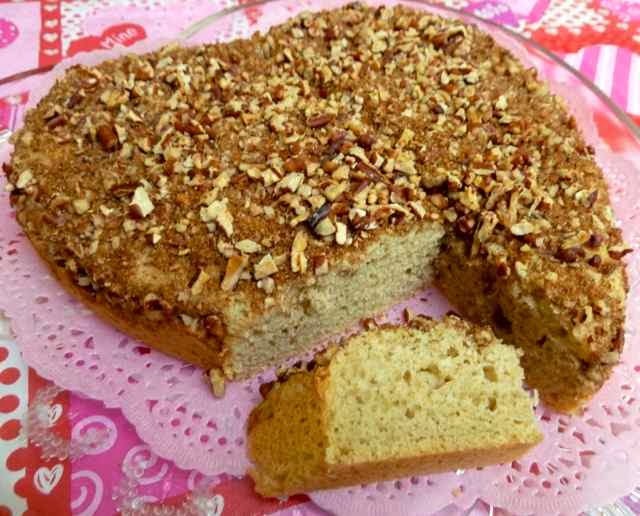 Simple, but tasty, this classic coffee cake is perfect with a cup of coffee or tea. I converted a recipe from Mollie Katzen’s Sunlight Cafe cookbook into a gluten free one. The last time I made this I was eating wheat, so it has been a while. Still as good as I remember, I like that there are nuts and cinnamon-sugar on top instead of crumble. I made it in the shape of a heart. Since it is February, with all the valentine decorations, I like to have hearts everywhere all month long. Coconut milk with vinegar added to make 'buttermilk'. Preheat oven to 350 degrees. 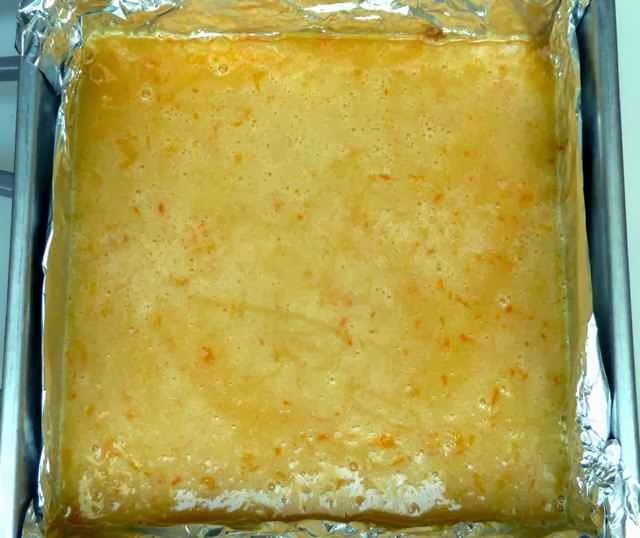 Prepare an 8-inch square or round pan by greasing it with cooking spray. 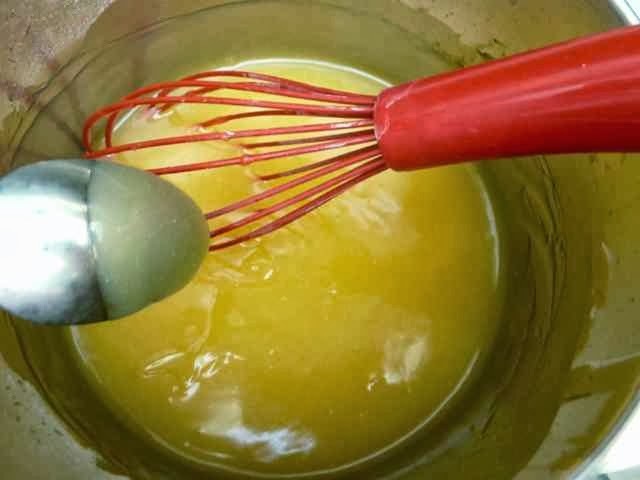 Beat the butter and 1/3 cup of sugar together with an electric mixer or in a stand mixer until light and fluffy. Add the eggs and vanilla and beat in well. In a separate bowl add the flours, xanthan gum, salt, baking soda and baking powder. Whisk together until well mixed. Add 1/3 of the flour mixture to the butter mixture and stir in with a spatula until just blended. Add 1/2 the milk mixture and blend in with the spatula until just mixed. Repeat. End by mixing in the remaining 1/3 of the flour mixture. In a small bowl mix the brown sugar, cinnamon and nuts (optional). Sprinkle the sugar cinnamon mixture evenly over the top of the batter in the pan. 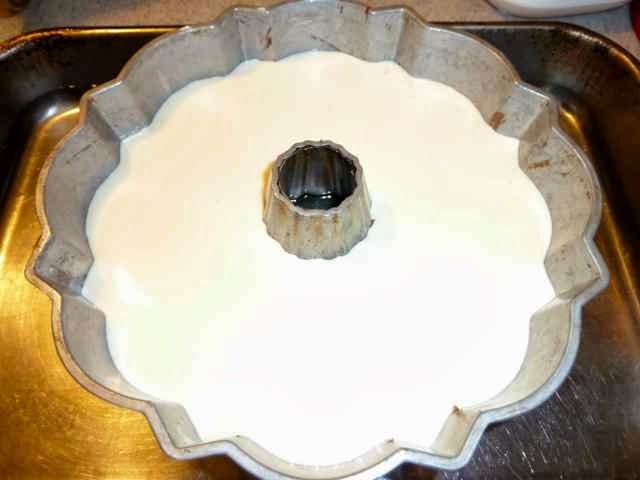 Raw batter in the pan topped with sugar mixture. Bake in the middle shelf of the oven for 20-25 minutes until a toothpick comes out clean when inserted into the center of the cake. Cool in the pan for 10 minutes before removing to a rack to cool completely. Or, if you plan to serve the cake directly from the pan, cool in the pan 15 minutes before cutting. 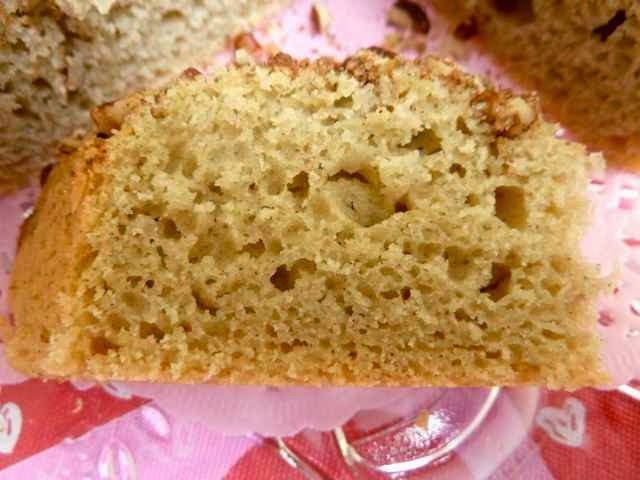 Close-up of a slice of Gluten Free Coffee Cake. Store leftovers in an airtight container for up to two days. You can freeze the pieces for longer storage. Warm up the leftover pieces before serving. GLUTEN FREE COFFEE CAKE glutenfreebakingbear.com Ingredients CAKE 1/2 cup (1stick) Unsalted Butter (for dairy free use margarine) 1/3 cup Sugar 2 large Eggs 1 tsp. Vanilla Extract 1 cup Sorghum Flour 1/4 cup Chickpea Flour 1/4 cup Tapioca Flour 1/2 tsp. Xanthan Gum 1/2 tsp. Sea Salt 1 1/2 tsp. Baking Powder 1/4 tsp. Baking Soda 1/2 cup Buttermilk (If you do not have buttermilk add 1/2 Tbs. of vinegar to the milk. For dairy free use non-dairy milk such as almond, soy or coconut.) TOPPING 2 Tbs. 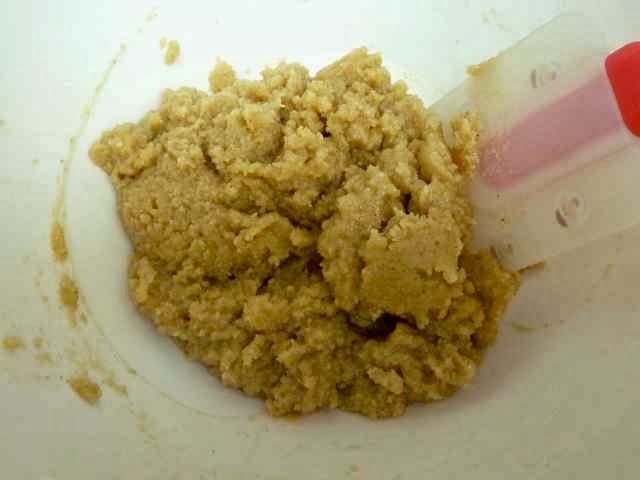 Brown Sugar - packed 1/2 tsp. 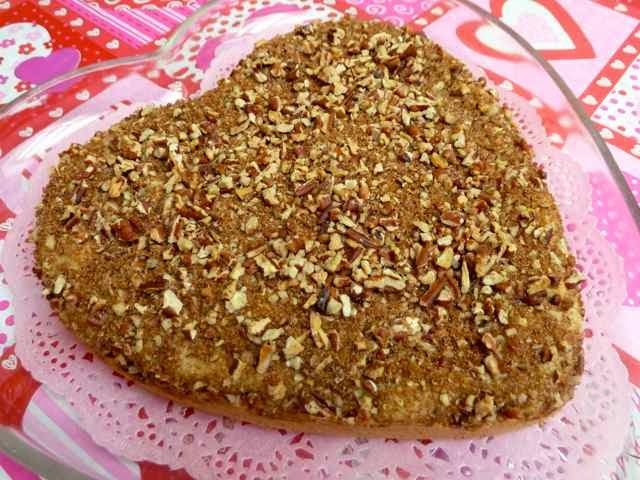 Cinnamon 1/2 cup Walnuts or Pecans - chopped (optional) Directions Preheat oven to 350 degrees. Prepare an 8-inch square or round pan by greasing it with cooking spray. 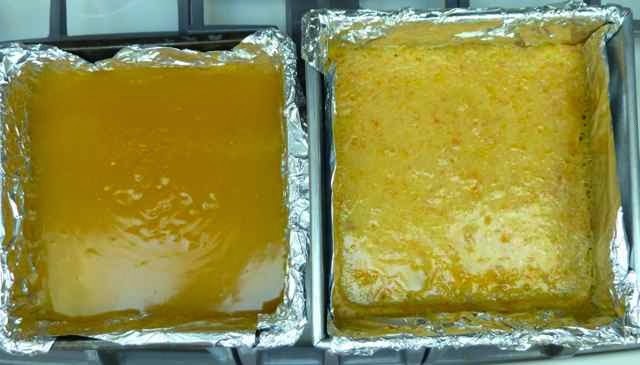 Beat the butter and 1/3 cup of sugar together with an electric mixer or in a stand mixer until light and fluffy. Add the eggs and vanilla and beat in well. In a separate bowl add the flours, xanthan gum, salt, baking soda and baking powder. Whisk together until well mixed. 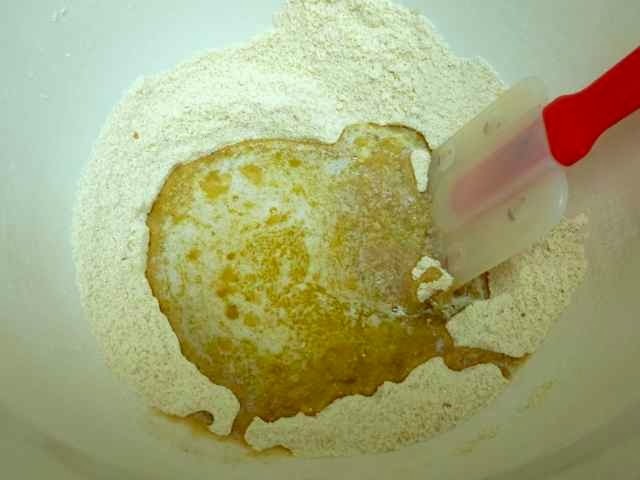 Add 1/3 of the flour mixture to the butter mixture and stir in with a spatula until just blended. Add 1/2 the milk mixture and blend in with the spatula until just mixed. Repeat. End by mixing in the remaining 1/3 of the flour mixture. Scrape the batter into the prepared pan and spread evenly. In a small bowl mix the brown sugar, cinnamon and nuts (optional). Sprinkle the sugar cinnamon mixture evenly over the top of the batter in the pan. Bake in the middle shelf of the oven for 20-25 minutes until a toothpick comes out clean when inserted into the center of the cake. Cool in the pan for 10 minutes before removing to a rack to cool completely. Or, if you plan to serve the cake directly from the pan, cool in the pan 15 minutes before cutting. Store leftovers in an airtight container for up to two days. You can freeze the pieces for longer storage. Warm up the leftover pieces before serving. I love peanut butter, but never liked peanut butter cookies. I looked at a recipe and realized why I didn’t like them, too much sugar. There is at least twice as much sugar in a typical peanut butter cookie recipe than in any other cookie recipe. 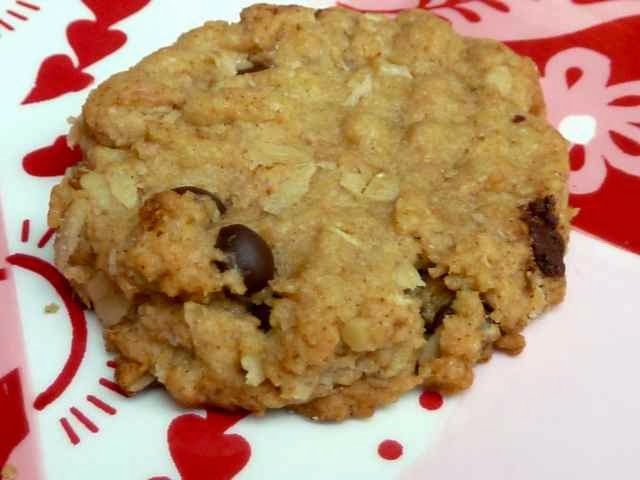 Using less sugar I created this peanut butter cookie recipe with oats. 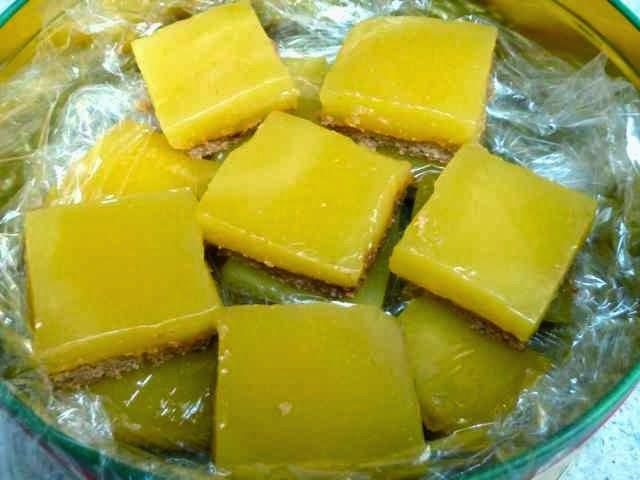 You can make them with butter and eggs or vegan without dairy or eggs. Chocolate chips, coconut and/or nuts are optional but recommended. Anyway you make them these taste delicious. 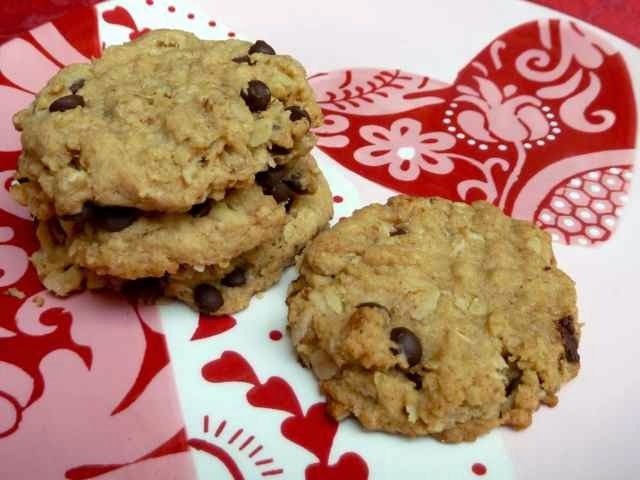 Yummy and different everyone will love these substantial cookies. 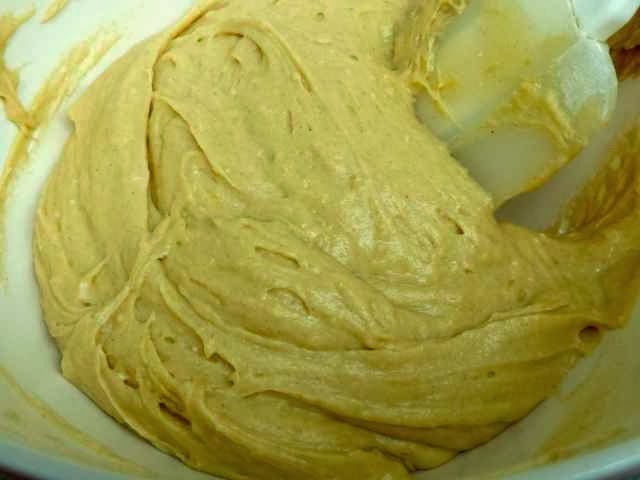 1 cup Unsalted Smooth Peanut Butter - I use a peanut butter that contains only peanuts, this recipe could turn out differently it the peanut butter contains other ingredients such as sugar, oil, salt, preservatives, etc. 1 tsp. Vanilla Extract - I used 1/2 tsp. Loranne Butter Vanilla Emulsion & 1/2 tsp. Vanilla Extract. Preheat oven to 375 degrees. Prepare baking sheets by lining them with parchment paper or silpat pads. In a medium bowl add the flours, salt (if using), baking powder, baking soda, xanthan gum and coconut. 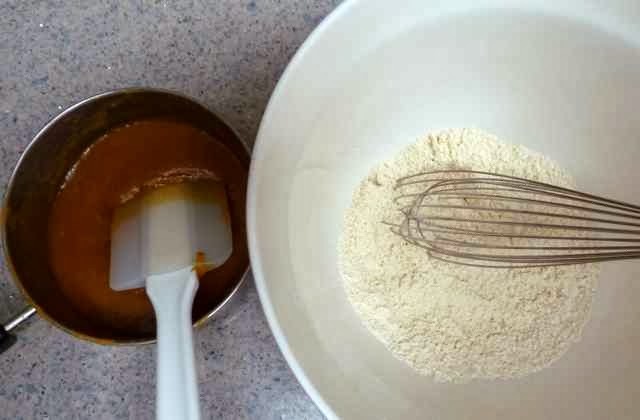 Use a whisk to mix together well. Set aside. In a large bowl add the melted butter (or margarine or oil) and sugar. Mix well then add the peanut butter, eggs (or water for vegan) and vanilla. Mix until well combined. Wet ingredients on left & dry on the right. Add the flour mixture and stir together well. Add the oats and if using, the nuts and chocolate chips. Mix in well. Using a scoop that measures 1 1/2-inches in diameter portion out dough onto the prepared baking sheets leaving 2-inches between portions. With a fork flatten out each ball of dough then turn the fork and flatten the dough to make a cross pattern that is typical with a peanut butter cookie. 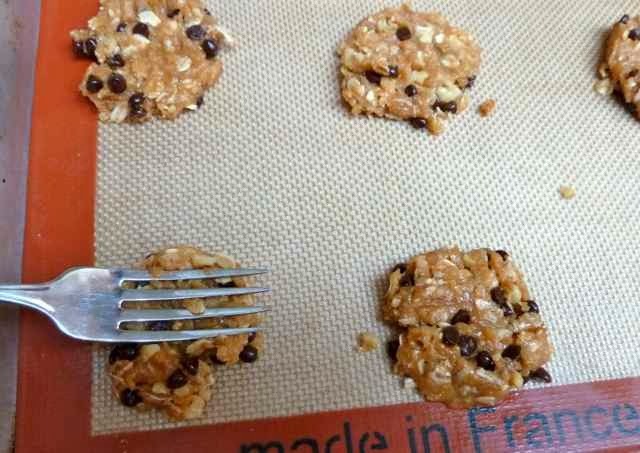 Cookies flattened with a fork in two directions to make a cross pattern. Bake 10-12 minutes until the edges and bottoms are golden brown. For a softer cookie bake at the lesser time until the cookies are barely golden. The longer cooking time makes a crisper cookie. Store in a tin or airtight container for one week. You can freeze the cookies for longer storage. 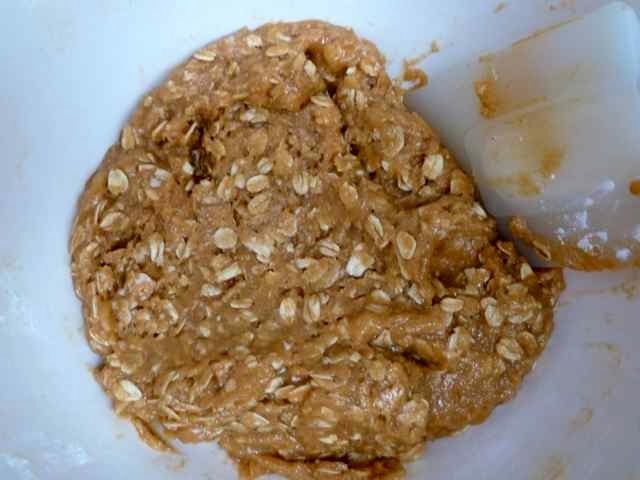 GLUTEN FREE PEANUT BUTTER OATMEAL COOKIES Makes about 48 cookies Ingredients 3/4 cup Sorghum Flour 1/4 cup Tapioca Flour 1/4 cup Chickpea Flour 1/2 tsp. Xanthan Gum 1 tsp. Baking Powder 1/2 tsp. Baking Soda 1/4 tsp. Sea Salt - OMIT if you use margarine or butter that is salted 1/2 cup Unsweetened Shredded Coconut (optional) 2/3 cups Melted Unsalted Butter - for Vegan & Dairy Free use melted margarine (I used Earth Balance Buttery Sticks) or olive oil 1 cup Unsalted Smooth Peanut Butter - I use a peanut butter that contains only peanuts, this recipe could turn out differently it the peanut butter contains other ingredients such as sugar, oil, salt, preservatives, etc. 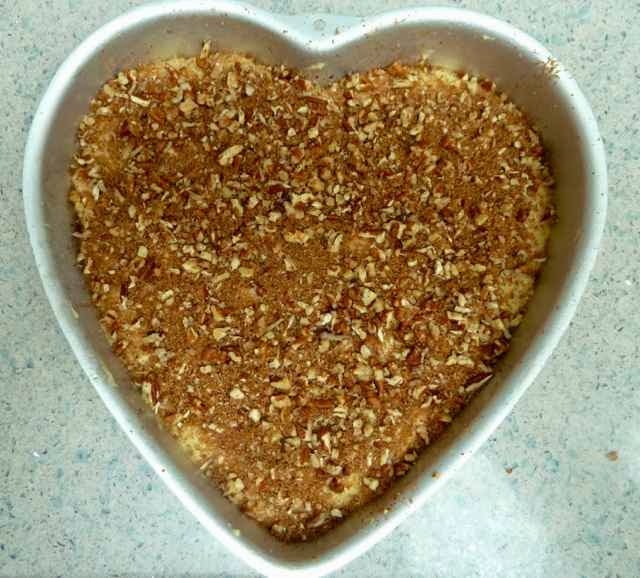 1 cup Sugar - I used evaporated cane juice crystals 2 large Eggs - for Vegan use 1/2 cup water 1 tsp. Vanilla Extract - I used 1/2 tsp. Loranne Butter Vanilla Emulsion & 1/2 tsp. Vanilla Extract. 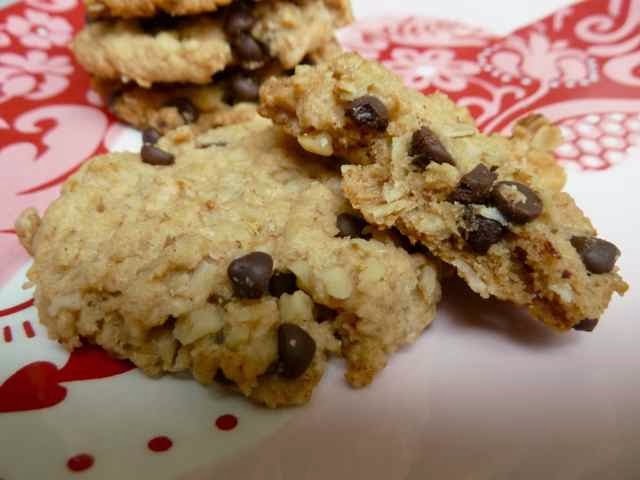 2 cups Gluten Free Oats - Old Fashioned not quick cooking 1 cup Chocolate Chips - for Vegan or Dairy Free use Vegan or Dairy Free Chips (optional) 1/2 cup Walnuts or Pecans or Roasted Peanuts - chopped (optional) Directions Preheat oven to 375 degrees. Prepare baking sheets by lining them with parchment paper or silpat pads. In a medium bowl add the flours, salt (if using), baking powder, baking soda, xanthan gum and coconut. Use a whisk to mix together well. Set aside. In a large bowl add the melted butter (or margarine or oil) and sugar. Mix well then add the peanut butter, eggs (or water for vegan) and vanilla. Mix until well combined. Add the flour mixture and stir together well. Add the oats and if using, the nuts and chocolate chips. Mix in well. Using a scoop that measures 1 1/2-inches in diameter portion out dough onto the prepared baking sheets leaving 2-inches between portions. With a fork flatten out each ball of dough then turn the fork and flatten the dough to make a cross pattern that is typical with a peanut butter cookie. Bake 10-12 minutes until the edges and bottoms are golden brown. For a softer cookie bake at the lesser time until the cookies are barely golden. The longer cooking time makes a crisper cookie. Store in a tin or airtight container for one week. You can freeze the cookies for longer storage. 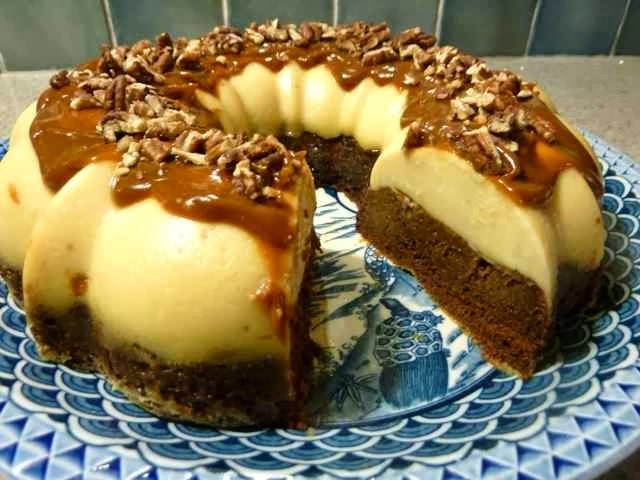 This Mexican chocolate cake with flan on top bakes up in a very cool way. 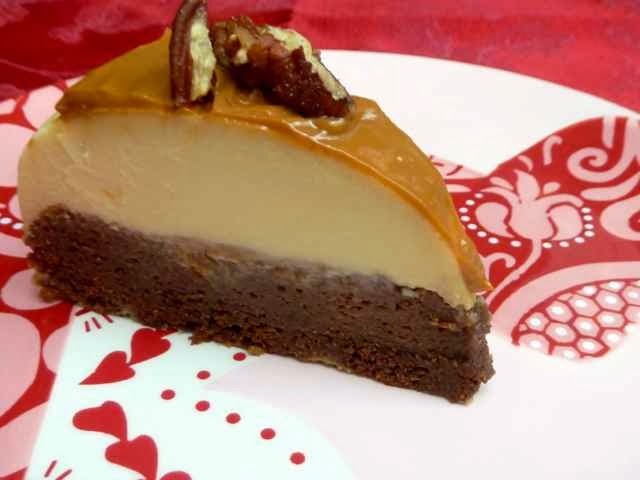 You put the chocolate (or vanilla) cake batter on the bottom of the cake pan and then pour the flan (a rich creamy custard) ingredients on top. Like magic, when it is done baking the custard and the cake have switched places. I was afraid that it would not work with gluten free cake batter, but it did! 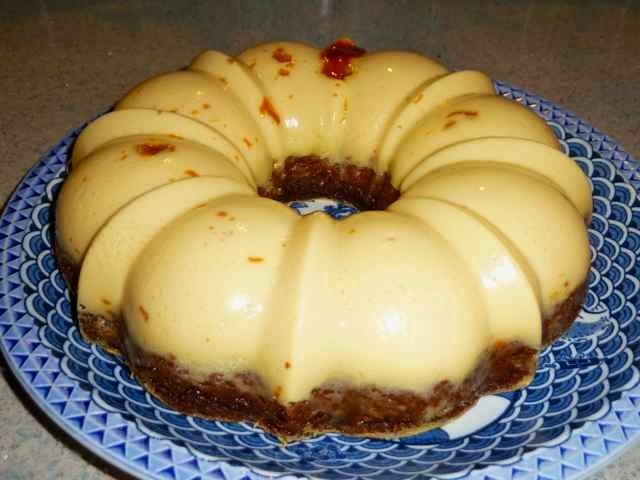 I am delighted with the results although the cajeta ended up between the flan and the cake instead of on top of the custard. Besides looking beautiful, this cake is dangerously good. Nobody who tried it has yet been able to stop at just one slice. A couple of years ago I saw a photo of this cake in a magazine and I wanted to try making it. There was one ingredient that I could never get my hands on, cajeta. Cajeta is a thick caramel sauce that is sold in Latin specialty markets. A few weeks ago I saw a jar of cajeta in Marshall’s* and I remembered this cake. You can make the cajeta from scratch if you can’t find a ready made jar. 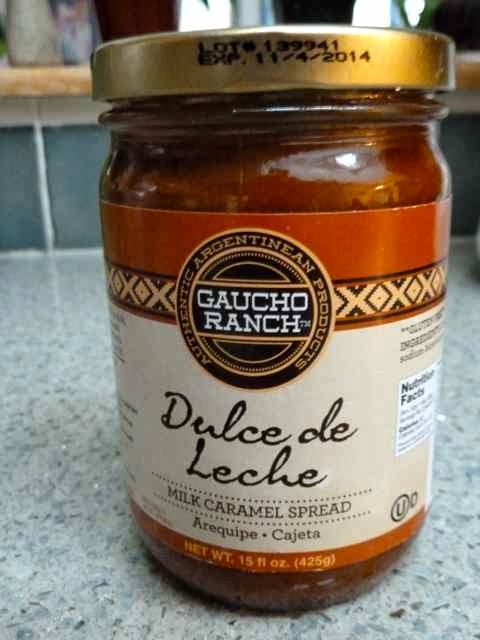 Here is a cajeta recipe that I found on My Mexican Recipes site. It offers both a slow and quick recipe. On foodnetwork.com there was a yummy looking cake from scratch by Marcela Valladolid. 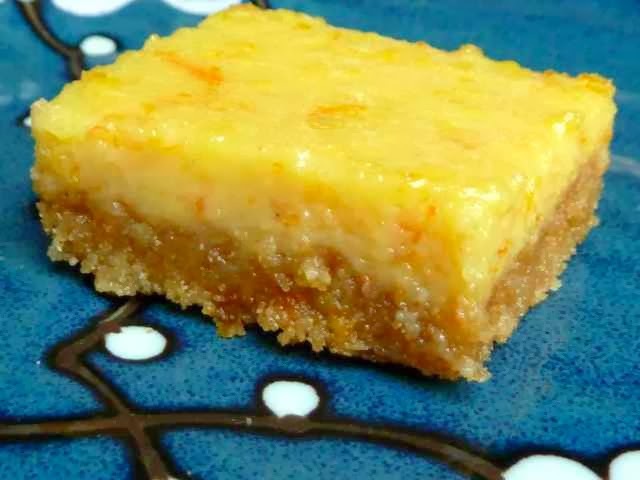 I converted this cake recipe into a gluten free version. 1/4 cup Chopped Pecans - I toasted the pecans first by spreading them out on a baking sheet and baking in the oven for 8 minutes at 350 degrees. Preheat the oven to 350 degrees. 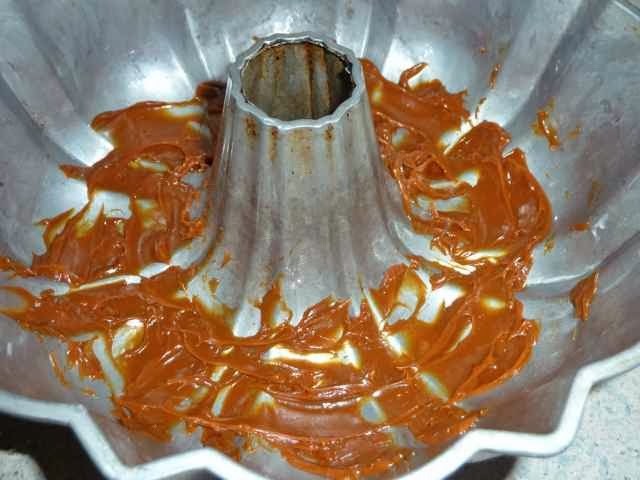 Prepare a 12-cup bundt pan by coating the pan with butter and then spreading 1/4 cup of cajeta on the bottom. Bundt pan with cajeta on bottom. In a bowl add the flours, cocoa powder, xanthan gum, salt, baking powder and baking soda and mix together well. In the bowl of a stand mixer add the butter and sugar. Beat until light and fluffy. Add one egg and the vanilla extract then beat in well. Add 1/3 of the flour mixture and 1/2 of the buttermilk to the egg and butter mixture and beat together well. Repeat. Then add the last 1/3 of the flour mixture and beat until well mixed. 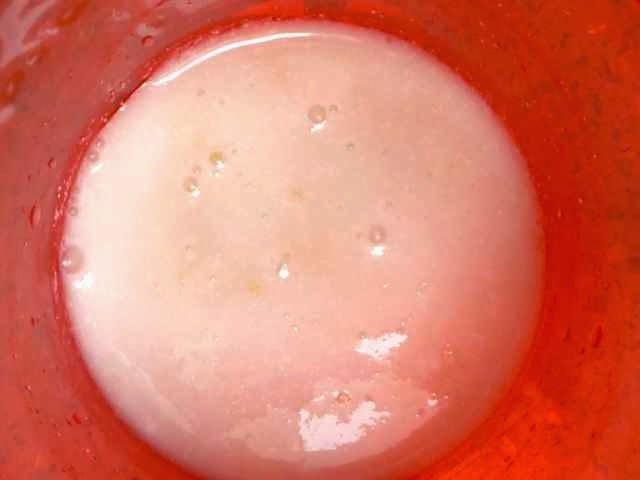 Cake batter after mixing is finished. Scoop the batter into the prepared bundt pan and spread out evenly. Next make the flan. 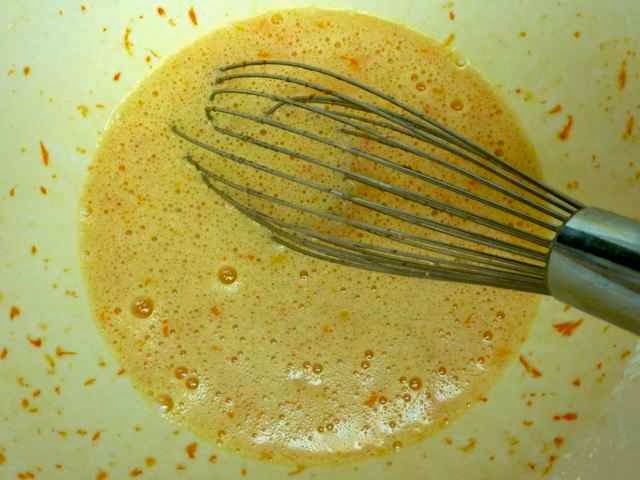 Add all the flan ingredients into a blender and mix on high until well blended, about 30 seconds. Fill a roasting pan with 1” of water and place the bundt pan with the batter in the roasting pan. Be careful not to get any water into the cake pan. Through a sieve, pour the flan mixture over the cake batter in the bundt pan. 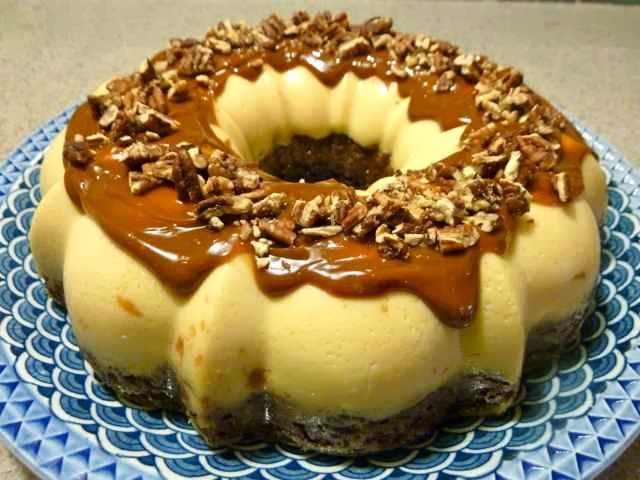 Bundt pan with flan poured over the chocolate cake batter. The bundt pan is in a roasting pan filled with 1-inch of water. 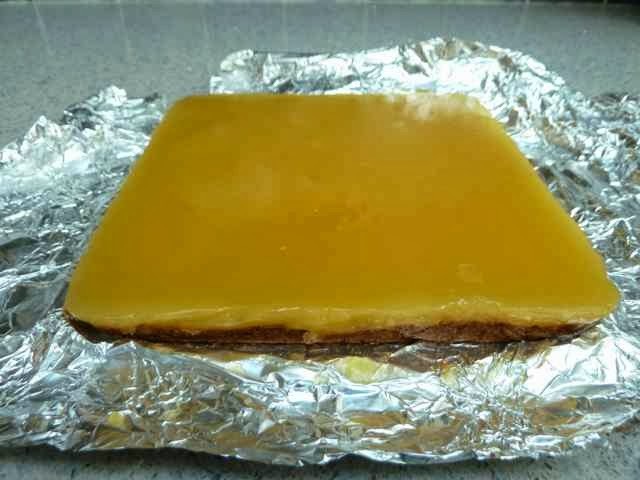 Slide the roasting pan with the cake into the oven, being careful not to get any water onto the custard. Bake 1 hour (mine took 1 ½ hours - could be my oven) or until the cake surface is firm to the touch or a toothpick comes out clean. 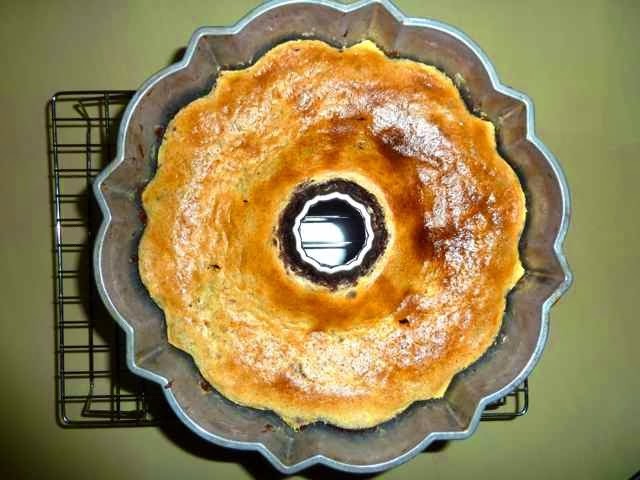 Baked Chocoflan cake cooling on a rack. When done, remove from the oven and cool the cake completely on a rack. This will take at least 1 hour. To serve, place a serving platter over the top of the bundt pan. Grasp the plate and pan firmly with both hands, jiggle a little, and flip over. Remove the pan. Cooled cake inverted onto a platter. Some of the cajeta is seen in random areas on top of the cake. Garnish by spreading 1/4 cup of cajeta over the top and then sprinkling with chopped pecans. I warmed the cajeta in the microwave for 20-30 seconds to make it easier to spread on top of the cake. Traditionally it is chilled for 24 hours before serving, but you can eat the cake right away if you like. Store any leftover cake, well covered, in the refrigerator. 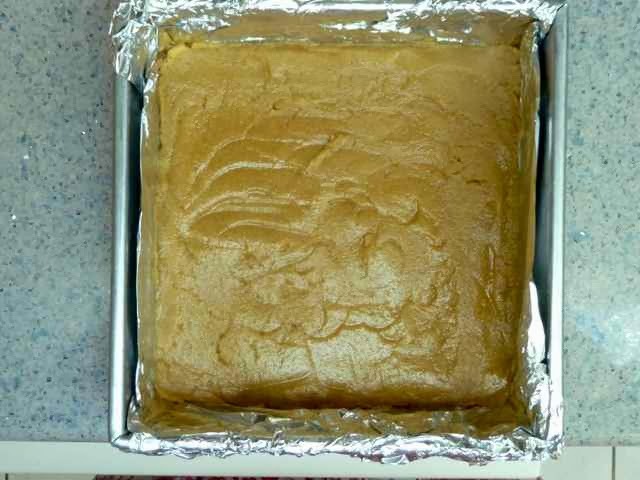 GLUTEN FREE MEXICAN CHOCOFLAN CAKE Ingredients FOR CAKE PAN 1/4 cup Cajeta 1-2 Tbs. 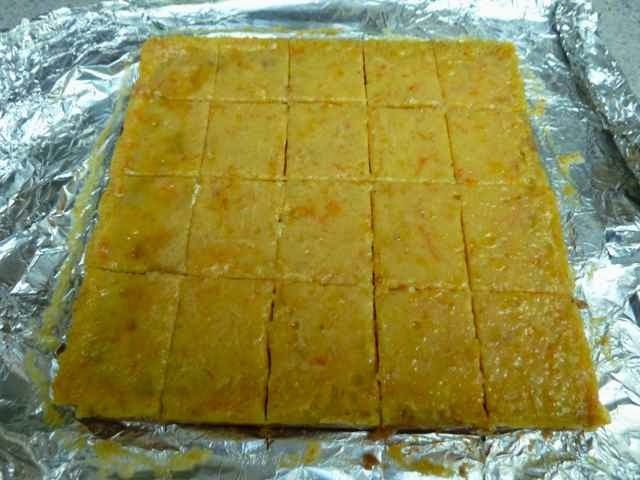 Butter - soft CAKE 10 Tbs. Unsalted Butter - at room temperature 1 cup Sugar 1 large Egg 1 tsp. Vanilla Extract 1 cup Sorghum Flour 6 Tbs. Tapioca Flour 6 Tbs. Chickpea Flour 3/4 tsp. Xanthan Gum pinch Sea Salt 1 tsp. Baking Powder 1 tsp. 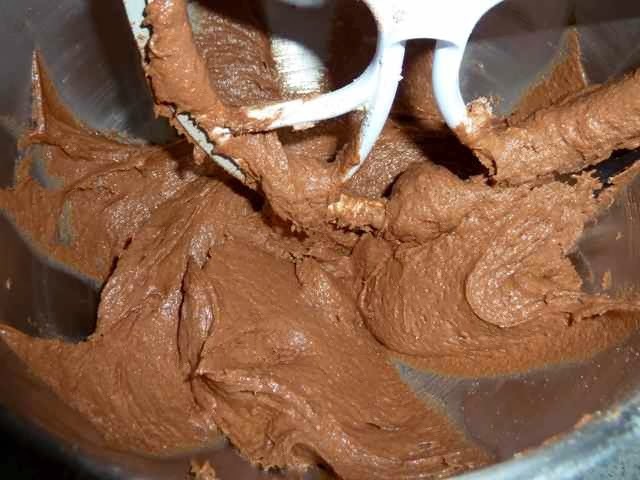 Baking Soda 1/3 cup Cocoa Powder 1 1/4 cup Buttermilk (or an equal amount of milk with 1 Tbs. 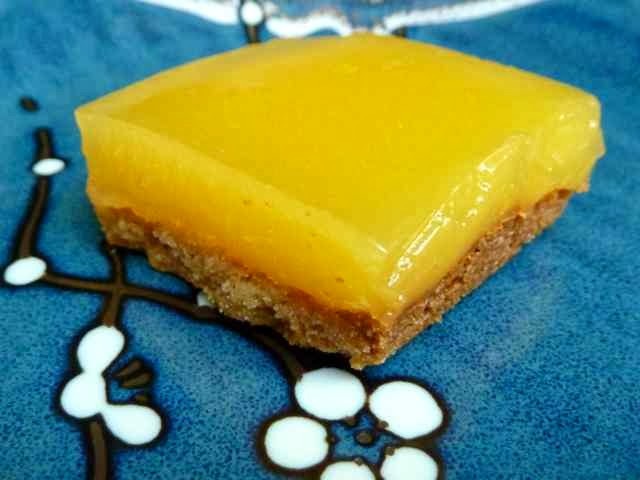 vinegar or lemon juice added and then allowed to sit for five minutes) FLAN (custard) 1 can Evaporated Milk (12 oz.) 1 can Condensed Milk (14 oz.) 4 ounces Cream Cheese - at room temperature 3 large Eggs 1 tsp. Vanilla Extract GARNISH 1/4 cup Cajeta 1/4 cup Chopped Pecans - I toasted the pecans first by spreading them out on a baking sheet and baking in the oven for 8 minutes at 350 degrees. Directions Preheat the oven to 350 degrees. Prepare a 12-cup bundt pan by coating the pan with butter and then spreading 1/4 cup of cajeta on the bottom. In a bowl add the flours, cocoa powder, xanthan gum, salt, baking powder and baking soda and mix together well. In the bowl of a stand mixer add the butter and sugar. Beat until light and fluffy. Add one egg and the vanilla extract then beat in well. Add 1/3 of the flour mixture and 1/2 of the buttermilk to the egg and butter mixture and beat together well. Repeat. Then add the last 1/3 of the flour mixture and beat until well mixed. Scoop the batter into the prepared bundt pan and spread out evenly. Next make the flan. 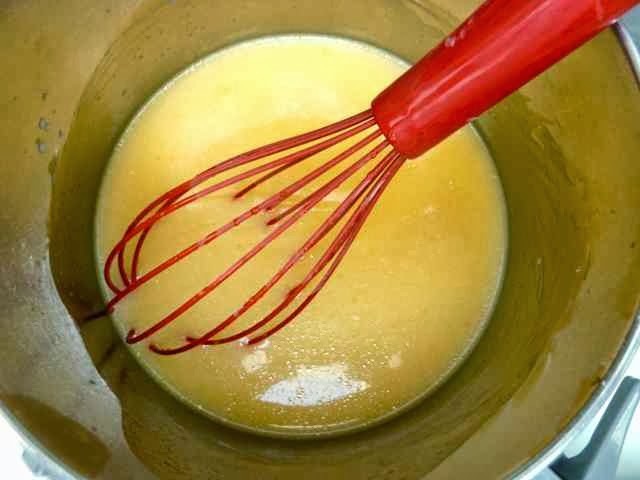 Add all the flan ingredients into a blender and mix on high until well blended, about 30 seconds. Fill a roasting pan with 1” of water and place the bundt pan with the batter in the roasting pan. Be careful not to get any water into the cake pan. Through a sieve, pour the flan mixture over the cake batter in the bundt pan. Slide the roasting pan with the cake into the oven, being careful not to get any water onto the custard. Bake 1 hour (mine took 1 ½ hours - could be my oven) or until the cake surface is firm to the touch or a toothpick comes out clean. When done, remove from the oven and cool the cake completely on a rack. This will take at least 1 hour. To serve, place a serving platter over the top of the bundt pan. Grasp the plate and pan firmly with both hands, jiggle a little, and flip over. Remove the pan. Garnish by spreading 1/4 cup of cajeta over the top and then sprinkling with chopped pecans. I warmed the cajeta in the microwave for 20-30 seconds to make it easier to spread on top of the cake. Traditionally it is chilled for 24 hours before serving, but you can eat the cake right away if you like. Store any leftover cake, well covered, in the refrigerator.